It was our last day in Amsterdam today, city of the silent assassins otherwise known as cyclists. 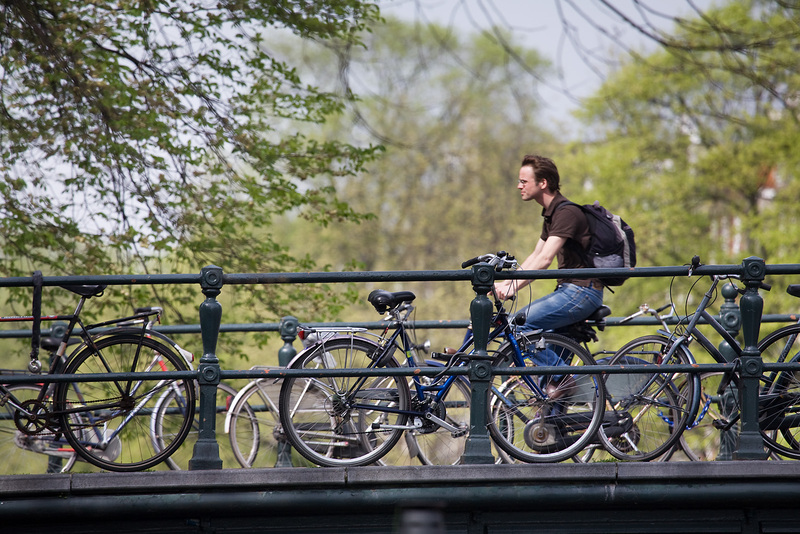 Bicycles are everywhere here, chained to every bridge, every bollard, every railing, stacked and double stacked against every conceivable surface of the city – no wonder the bicycle has become emblematic of Amsterdam. It is clear too that the city authorities have actively encouraged this cyclist boom. Given over to cyclists are designated cycling lanes and crossings aplenty, but alongside these are normal roads and tram lines, as well as bizarre junctions where roads meet bridges, and I find myself walking around in a confused daze as to where I should be crossing the road and where I should be walking – there are plenty of cycle lanes, fewer pavements. It doesn’t of course help that cyclists here routinely ignore red lights, so the dutch green man roughly translates into: you can cross, by at your peril. Then you must navigate the roads with every sense attuned to your surroundings, since these bicycles are not only plentiful in number, but deathly silent in sound. Consequently I have narrowly avoided collisions with cyclists at least once every hour of my stay in Amsterdam, as cyclists, travelling at great speed, seem to come at me completely out of the blue. Of course the cyclists must be praised for keeping the town a lot fresher, and I particularly like the parents who cycle around with their children in a special basket at the front. Not sure how all these people get away with out wearing helmets though… I haven’t seen once since I arrived. Anyway, once we had negotiated a series of cycle lanes, perilous junctions and even a bridge which opened to allow the longest barge through that I have ever seen, we eventually made it to the final stop on our Amsterdam cultural map: The Hermitage Amsterdam. The Hermitage is the Amsterdam annex of the St Petersburg giant. The museum, which was first opened in 2004 and was the result of the apparent close historical bonds between Russia and the Netherlands, aims to show a revolving selection of works from the main Hermitage collection, works which would otherwise be relegated into storage alongside thousands of other gems of Catherine the Great’s amassed collection. The works are then displayed in a stunning new gallery space which opened in 2009. This former hospital has been renovated to an indubitably high standard. Large marbled floor space is flanked with spotlessly painted walls. Windows overlooking the sunny canals are partially blacked out but allow sufficient light to flood the spacious rooms. Glass stairs lead from the main galleries to a mezzanine level, and the museum cafe exudes New York hotel chic. Most importantly of all, the paintings appear to glow beneath all-enhancing LED lighting technology, and works are hung with sufficient surrounding space so as not to overwhelm. 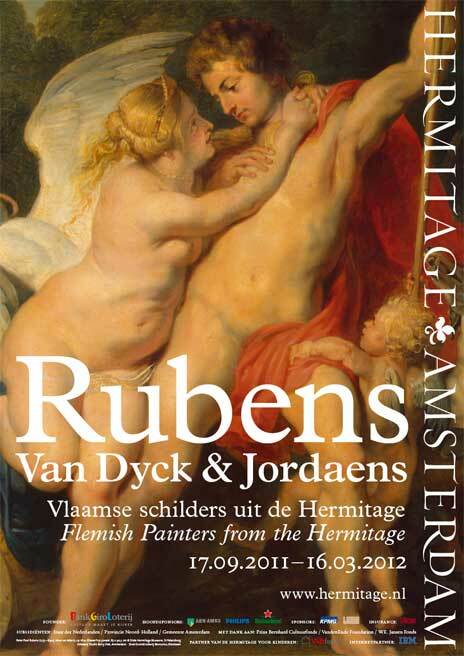 The current showing focuses on Flemish giants Rubens, Van Dyke and Jordaens, a show which has in fact proved so popular that its orignally planned run has been extended by three months. No wonder, since the collection on show is pretty stunning and enticing in equal measure. 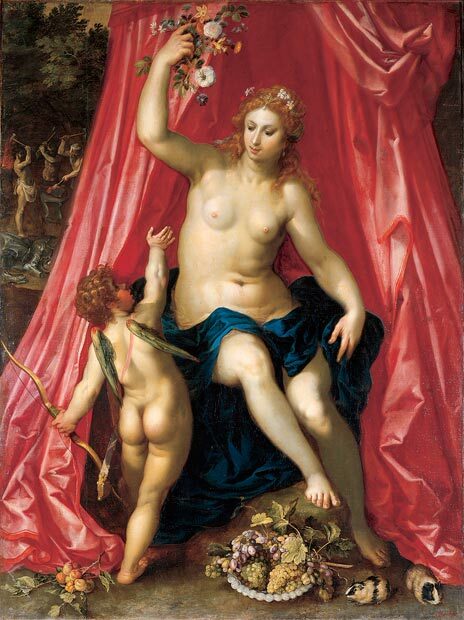 So often I look at masterpieces of the Golden Age with a blank stare, overwhelmed often by the detail of the depiction, or more often than not, by the vast numbers of such paintings squeezed side by side in repetitious national collections such as the Louvre or London’s National Gallery. 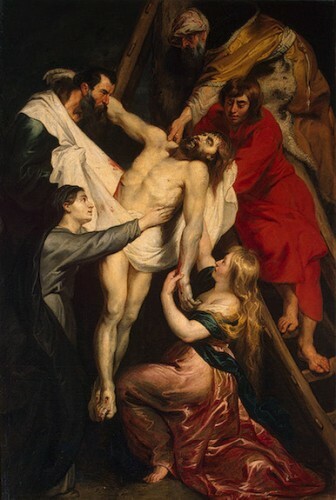 But with the luxury of this focused show in a new airy art space came the opportunity to admire the astonishing talent of these master artists, such as the sumptuous folds of material against the musculature of Christ in Rubens’ Descent from the Cross, and the small details of sea shells or guinea pigs in The Union of Earth and Water by Rubens and Venus and Cupid by Hendrick Van Balen. While the contemporary movement of artistic trends seemed to focus progressively on the introspection of an artist, with these Flemish masterpieces, the intention was to wow, show off and astonish. The works succeed on these fronts, whether through the breadth of their sheer dimension or in the painterly skill of the intricate still lives. They are no less meritorious because they do not attest to the tortured soul of the artist, nor are they any less worthy of our attention. Through skill and insightful allegorical symbolism, these works are capable of transforming the audience into another world, to educate, and also, in the case of portraits, to immortalise people and lives for future generations. 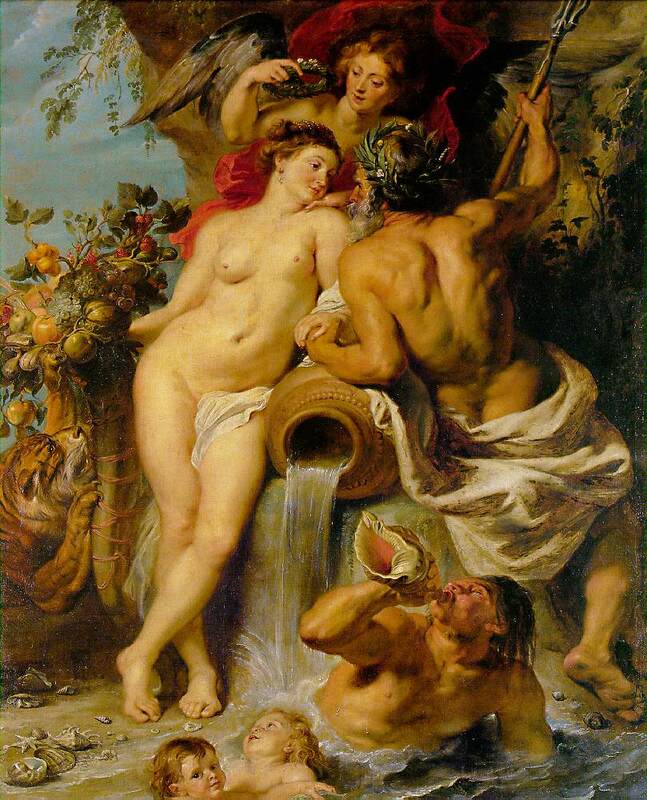 Sorry Van Gogh, but today Rubens beat you. So leaving this impressive artistic institution (having been severely slighted in said chic cafe which was half reserved for some as yet unpresented favoured group leaving no space for our discerning custom), it was nearly time to wave adieu to this watery wonderland of Amsterdam. A quick stroll through the charismatic university quarter and the bustling shopping streets led us back to our hotel from where we headed, regretfully towards the station. Our walk back, past those elegant town houses, flanked by the transient reflections of Amsterdam in its canals, where red lights were being switched on for an evening’s work, and where familys and friends cycled energetically and happily over bridges and through the city’s quieter streets, served as a reminder of what a multifaceted city Amsterdam is, but also one where life seems a little more laid back, a little less tense, a sensation perhaps created by the water flowing like lifeblood throughout the city, bringing reflection, light and a fresh breeze to all. Goodbye Amsterdam and thanks for a superb city break. Faithful Daily Norm readers – thanks for reading about my trip and therefore sharing the experience with me – come back tomorrow for all of my restaurant/ hotel reviews and on Friday for my photos!